Politics are a tricky business. Luckily, 1797 & Associates is here to help with all your creative needs. 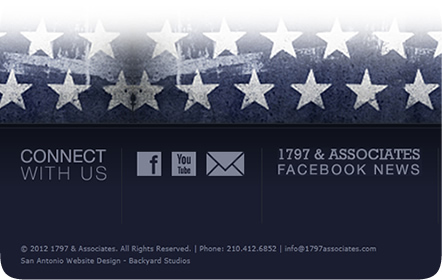 Specializing in political marketing, 1797 & Associates works with you to ensure your campaign is successful. 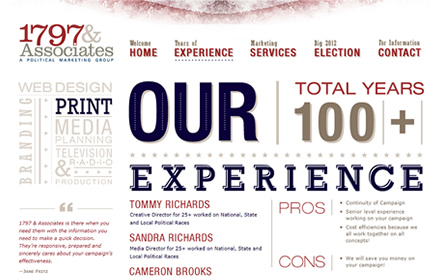 The experience 1797 & Associates has totals to over 100 years, which is about half as old as the United States. 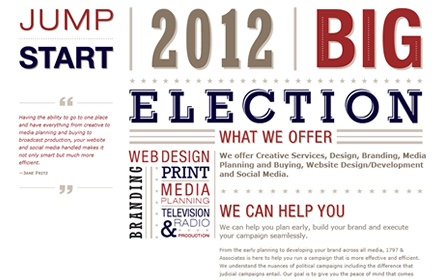 From start to finish, they oversee all aspects of the campaign, including social media, design, branding, media planning and website design. Let them take care of your campaign, it’ll be one less thing to worry about. Because of their unique focus, 1797 & Associates had to tell their story in a political manner. Red, white, navy blue and taupe are the only colors on the website. Stars and stripes decorate the pages, taking cues from old American flags. 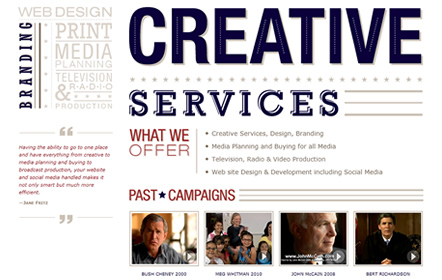 Typography became our biggest graphic element, as we used no photographs on the website. In fact, the animated sliders on each page are nothing but expertly handled typography. Every page also features a different testimonial from clients that have worked with 1797. As it happens, San Antonio Judge Victor Negron is one of their clients, and he was very satisfied with his campaign.